If you, like so many popular genre singers, have trouble straining in your upper chest voice, you may find the following insight helpful. I know a young artist friend who studied with a $400 dollar an hour voice teacher out in LA (I don't remember his name. She had problems with pitch, control and range. She has developed a very natural, controlled voice and to get a major pop recording contract. I asked what her vocal teacher did to help her. He told her that her problems lay in the uneven strength she had present between these two controlling sets of muscles. His training centered on strengthening the weak set (that controlled her head voice) to match the strength in the strong set (her chest voice). Muscle naming aside... This makes all the sense in the world to me. I have been working with people instinctively this way, (using exercises to strengthen head voice especially with people who strain in chest voice) without knowing the specific anatomical reasons, and now have even more reason to use this insight with my students. And big plus... this balance will also help you with your PITCH accuracy! .... practice singing in your head voice. Do exercises that take you up far higher that you'd sing songs, but be sure you're not leaning or pushing to do so. (You can even push in head voice!) Just go as high as you are able to without strain. Keep doing this on a regular basis and you will strengthen the muscles that control your upper register. I believe you'll find that your head voice will begin to influence your chest voice and you will be able to reach notes that were previously difficult to sing without pushing. .... practice singing in your chest voice. Sing songs and do exercises that take you up into middle voice, but keep it "talking" voice. Important... while using this voice, DON'T PUSH. This should help, over time, strengthen the lower voice muscle set. If you're not sure what voice you're in, find a good voice teacher who can help you. If you are a student of my "Power, Path & Performance" method, and have the cds, check out the exercises I call "Blending Steps". If you know what voice you are singing in, and can change the voice, you should find great benefit from doing this. Also remember the difference between what I call "pushing" and "pulling" words. One of the best things you can do for your voice is to learn to pull it out of your resonation spaces instead of push it in any way, with any muscles you want to name! Ok.. got some great comments on writing lyrics; so on to the next part of the songwriting equasion: here are some tips on writing the music. should have a memorable melody. should have structured patterns of rhythm. These structures can be more free-form, however it takes experience and study of patterned music to learn how to create free form music, such as musical theater dialog set to music, art music, etc. Most of the time I see a lack of patterned rhythm, I hear badly stitched together pieces of music that instantly cry out... well, BAD. stands out better with an unpredictable melody line and/or chord progression. However, should be something that still fits the genre you are writing for. SHOULD BE SINGABLE! Watch words and word combinations that the tongue finds difficult... try to get your lyrics to flow from the mouth. I also find that many musicians who are not singers tend to write melodies that are not very singable. Writing wide vocal range songs can be good if you are pitching to singers with great range, but remember that male singers usually have larger ranges than females. As suggested by either Quincy Jones or Baby Face (I can't remember which), melody should be strong played on piano without the bells and whistles of production. Not always, but many times great melodies can cross genres when produced in varied ways, as in songs like "I Will Always Love You", "I Swear", "I'll Be Your Baby Tonight", etc. when recorded - should be produced, with budget considerations, with as much quality and sonic excellence as possible, comparing the sound to current radio hits in that genre. Go to the NSAI website and check out the workshops there. Consider joining NSAI. Study the lyrical and musical forms and rhythmic structures of songs YOU love. How many lines in the verse and chorus? How many beats in the lines? How did they make a "bridge"? How did they end the song? What was the musical "riff" that makes you think of the song? Try taking a song you love and putting your own lyrics to that song's music. You can't, of course, end up using that music, but you can structure your song the same way. Then you put new music to your lyrics. Do you have any other thoughts, questions, websites or insights? Please join the conversation and click COMMENT. Wow, I got some great comments on my last post about writing lyrics. Before going on to writing music, I'd like to post on my commenters' thoughts about lyrics. And yes, I like Simon & Garfunkle (master songwriters), Amy Grant too... much of her songwriting is great, but she cuts those mindless pop ditties probably because somebody tells her she needs to have some commercial songs for the radio. It's unfortunately the business of being a megastar. Some of my favorite songwriters happen to be all the writers I listed who wrote the above songs. I am also a big fan of Nancy Griffith. Bob Dylan, it goes w/o saying. And Bruce Springstein. Yes, I agree that its best to get a "hook line" that is memorable. It is important that this line be unique, and powerful enough to catch the attention of the mind. A songwriter does indeed do well to look for "hooks" and central song ideas in the lives of those around him or her. Many hit songs have been inspired by the offhand comment of a stranger. But it's also important to be keenly observant, so as not to write a superficial lyric. I, for instance, find it hard to write a male lyric. I have done it, but usually need a male co-writer. My mind thinks like a girl. Some writers are better at "getting into other peoples' skin". Dave Loggins comes to mind. I think he could write like a Martian if he had ever met one! Though it can be a jumping-off point to write, I don't think it's important to have the final title of the song until it's written, because I've frequently had the song I was writing take a different direction than I thought, and a better title made itself known. Sometimes what I thought was going to be the title just ended up being an important line (sometimes the first line). Come to think of it, I may do a post listing some jumping off triggers for songwriting. Whatdya think? I am always grateful for your comments! I get lots of questions about songwriting. This is, of course your inner voice, and so the subject belongs on "All Things Vocal" (don't cha think?) I intend to write a 3-part series on songwriting, beginning with my thoughts on writing great LYRICS. should be written with intellegence and cleverness, avoiding trite phrases and cliches. should try to say something unique about the subject. Drawing from true personal experience helps find the most unique perspective. even if written third person, should be written from the vantage point of a participant instead of a spectator to the story. Writing from a personal vantage point makes is much stronger and more real than writing what you think someone else knows or wants to hear. should be consistant in its language (if it's earthy, say it with "down-to-earth" language all the way through the song... if poetic, keep that voice going... if easily understandable with clear images, or if more obscure and symbolic as in many great pop songs, be sure it sounds like the same person talking in the whole song. needs to say that which will make the listener connect with the singer on an emotional level, even if that level is just a happy or freed feeling. should make the listener identify and actually like the singer (duh); the listener frequently will take on the singer's persona while listening. should not be "preachy". Instead... just tell the story and let your audience draw conclusions. They don't trust you when you condescend or preach, like you are smarter/better/wiser than them. should not lead to hopelessness, unresolved hatred or violence towards others. should if at all possible have an unexpected twist or two. should have some kind of structured pattern of lines. I'll give my songwriting suggestions for writing MUSIC on my next post. On my third post, I intend to suggest HOW you learn to do the things I mentioned, books you should study to develop your skills, what you need to know about co-writing, how to prime the pump of your inner muse, etc. what are your favorite songwriting books? what suggestions for successful songwriting do you have to pass along? Please join the conversation by clicking the "comment" link below this post. Thanks! I still love doing bgvs... for over 40 yrs now! I get asked this question a lot... How does one go about getting started if they are interested in singing bgv's (background vocals)?" vocal training to be able to perform the feats of what I call a "stunt singer". 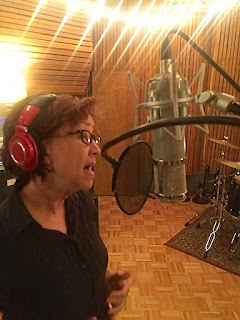 It takes more stamina and control to be a great background singer than to be a lead singer, because you will have to trace and blend with another voice perfectly, taking on the lead voice's tone, personality, rhythm, phrasing and accent, or adding whatever different texture of voice the producer wants to offset the lead singer's voice. I have a specialized training program just for studio singing you might want to study! to be able to change your voice at the producer's request. to be able to hear and create harmony parts. experience singing background parts with live performers and/or backing vocals in a recording studio. No matter what kind of training you have, there's no substitute for actual experience. It's a catch-22; you need experience to get experience, so take whatever opportunity you can possibly find or afford to get in front of a stage or recording studio mic. a demonstration (demo) recording of your voice. This can be a simple guitar or piano/vocal, a karaoke track with your voice recorded over it, or can be full instrumental tracks created just for you. Just make sure that your vocal performance is the most important thing you record. Don't spend money on tracks without budgeting enough time for great vocals. duh. referrals from people you've sung with and sung for. networking, networking, networking. This takes time and persistance; people skills are very necessary. Go to writers nights and to concerts, hang out with musicians and songwriters you know. If you know any session singers, you might ask them to sing with you and assess how well they think you do. to realize that you may need to keep your day job. Background work is very competitive and usually has a great deal to do with being at the right place at the right time. Sometimes when someone else can't make a session, an untried singer will get a chance. However, it is important to be generous of spirit, to support and recommend other singers trying to get work as well. Undercutting your fellow session singer will come back to bite you. It usually takes years to break in to regular session work. Make sure you build the right reputation. They sound great with the lead singer. They learn their parts fast. They can do "head charts" (just come up with the parts in their heads), read the Nashville number system (if in Nashville), and they can read written music (traditional notes). You can get hired without being able to do all three, but you are considered a much more versitile singer if you can work whatever way the producer, artist or group leader wants. They have positive, professional attitudes and work well with others. They can be depended upon to show up on time, every time. They are nice people. The music business is a small world, and it gets to be community where where you like to work with friends and good hearted people. Some of my best friends in the world are background singers. Good luck... and don't forget to check out the ultimate vocal training course for singing in the studio! I just wrote with a wonderful new pop artist, Skye Dyer, today. She was suffering from an allergy attack, with the resulting swelling of the vocal cords. As I watched her sing our song for a worktape cd we made, I noticed something she did to accomplish a good vocal in spite of her compromised vocal condition. She backed off the pressure. As she "went for" the highest part of the song, I inwardly cringed as I played the keyboard, expecting her to do what I see far too many singers doing... applying force to reach that note. And she didn't. And it came out with an unexpected clarity and openness. Get out your hardest song. At the place you have the most trouble, try applying so little air pressure that it seems you're breathing the note in instead of out. Spin it, weightlessly, using pelvic floor support and having your head in line with your tailbone. Let me know how it works for you. And look for Skye Dyer songs and concerts on the horizon. She's great. I recently received an emailed question about pitch problems while recording vocals that I'd like to share here. I've just started recording some songs and have run into a problem. When I sing my vocals, I am off pitch. I play in a band and have for a few years and we seem to be very popular locally. I sing lead for roughly 1/3 of our songs and have never had anyone tell me my singing was bad or that I couldn't sing. I have read about headphone mixes, etc. and am wondering about this and the recording process. We are recording with headphones , mic, drum machine, into a Korg d3200. Your help would be greatly appreciated. When an artist is really good in live performance, there is quite often a curious thing that happens when that artist goes into the studio. The person ceases to move, ceases to "communicate" with the body, the hands and the face. The weight of the mic is missing, so the singer subcounciously leans forward with the head, causing the chest to cave in a bit. This causes breathing problems, affecting both breath support and breath control. This may very well be the source of your pitch problems. To fix this, try moving your feet farther in towards the mic, causing you to subconsciously have your head farther back (or you'll hit the mic with your mouth) and your chest will open, stretching the ribcage and diaphragm out, enabling you to get both better inhale and better control of that breath when you sing. Also, try using your hands, like in live performance. Don't grab the "cans" with your hands, because this tends to put subtle weight on your ribcage, closing it. Another thing I frequently have people do is put fingertips together in front (I call this "studio hands"). When you "go" for a note, you'll press your fingertips into each other, causing your chest to open and your head to go back. Be sure you're not lifting your chin, keep it level and floating and just let your neck be flexible and your spine will take your head back. Another thing you need to watch is that you need to be very present with the pitch in some kind of acoustic instrument in the track. Don't "listen" for pitch from the bass, because overtones can throw you off. Try taking some of the instruments (especially swimmy instruments or busy instruments) out of your headphone mix. Also, watch how much reverb you are using in the mix. Too much or not enough, and you won't do as well. Just enough to make you feel "live", but not enough to get lost. Lastly, I recommend having one headphone half-off one ear. That grounds you in the vocal booth... And gives you more of an accurate sense of the pitch you're using. Not everyone does better this way, but most do (I certainly do). If anyone has any feedback after using suggestions I've made, I'd love to hear from you (click comment link below this post). Thanks!